Walking with Jesus: Day 153: John 1:19-34 & Psalm 149 - How is Jesus the Lamb of God? Day 153: John 1:19-34 & Psalm 149 - How is Jesus the Lamb of God? Much of the power of John's Gospel comes in how much meaning is packed into the simplest statements. 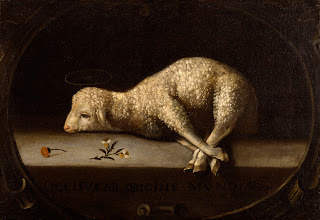 When John the Baptist saw Jesus coming toward him, he uttered one of the most meaningful statements in all of Scripture: "Behold, the Lamb of God, who takes away the sin of the world!" In this single sentence, John the Baptist gives the whole Gospel and the very essence of the person and work of Jesus. How is Jesus the Lamb of God? How does He take away the sin of the world? 3. Jesus is the Lamb of God because He died to cover us from God's wrath. The blood of the Passover lambs was spread on the lintel and doorposts of the homes of God's people in Egypt. The blood thus displayed was a covering, a protection from the wrath of God, which "passed over" their houses. In the same way, Jesus' blood covers us, hiding us from the wrath of God. 4. Jesus takes away the sin of the world by dying in our place. The penalty for sin is clear in Scripture: The soul that sins shall die (Ezekiel 18:4). The wages of sin is death (Romans 6:23). This is why "without the shedding of blood there is no forgiveness of sins" (Hebrews 9:22). So Jesus is the Lamb of God who takes away the sin of the world because He died for us, in our place. 5. Jesus is the Lamb of God because He was provided by God and was offered up to God. He is both the Lamb given by God and the Lamb belonging to God. God gave Him to the world so that He could offer Himself up to God in behalf of the world. So much powerful Gospel truth to contemplate, all packed into one simple exclamation from John the Baptizer. If we see our sin and our need for forgiveness, we need to see the sinless perfection, willing submission, effective covering and substitution provided by the one and only Lamb of God. We need to see that He not only takes away the sin of the world, but He takes away our sin, all of it. Praise God for such a Lamb! Your praise in the assembly of the godly! making melody to You with tambourine and lyre! You adorn the humble with salvation. let us sing for joy to You on our beds. This is honor for all Your godly ones.